Create these Cheesy Mummy Wrapped Dogs for your kids before they head out for Halloween night. 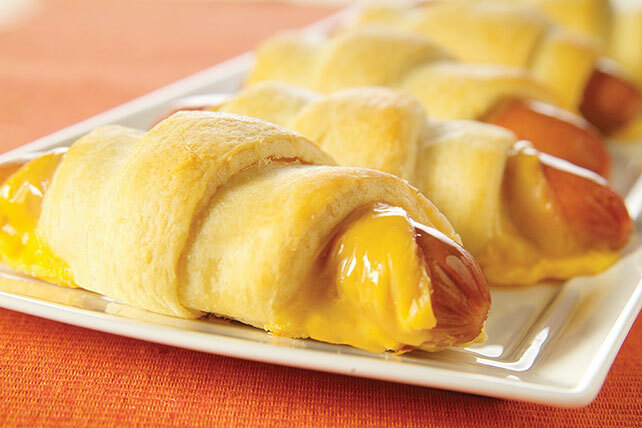 Mummy isn’t the only one who can whip up these cheese-alicious wrapped dogs in no time. They’re so easy, even your kids can help. Unroll dough into 8 triangles. Place Singles triangles and franks at short ends of triangles; roll up. Place, seam-sides down, on baking sheet. Bake 12 min. or until golden brown. Prepare using KRAFT 2% Milk Singles and/or OSCAR MAYER Light Beef Franks or Fat Free Wieners. Spread 1 tsp. GREY POUPON Dijon Mustard, KRAFT Original Barbecue Sauce or HEINZ Tomato Ketchup on each crescent roll triangle before topping with Singles and frank.